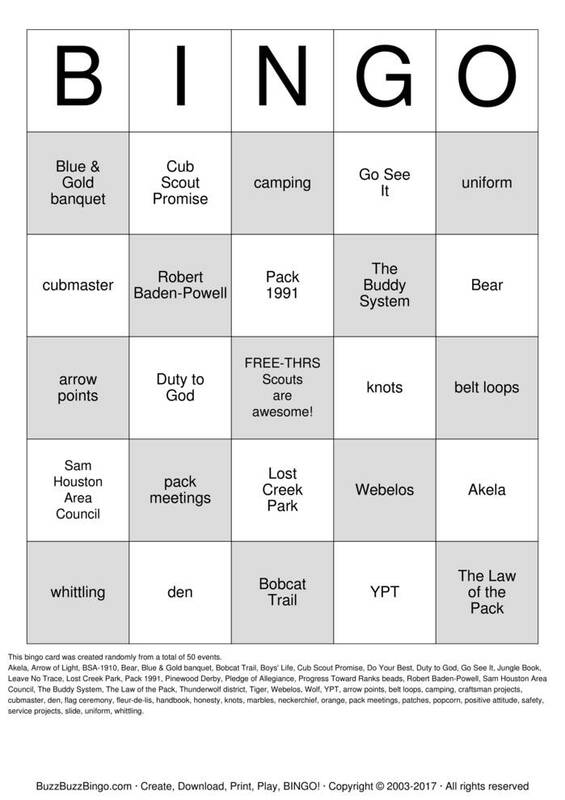 Pack 1991 Cub Scouts Bingo Cards to Download, Print and Customize! Print 2 pages of Pack 1991 Cub Scouts Bingo Cards for free. Download a PDF with 2 free pages of bingo cards plus instructions and a randomized call sheet. Play Pack 1991 Cub Scouts bingo in a browser or customize the events, free space, etc. Purchase more randomly generated bingo card pages below. Akela, Arrow of Light, BSA-1910, Bear, Blue & Gold banquet, Bobcat Trail, Boys' Life, Cub Scout Promise, Do Your Best, Duty to God, Go See It, Jungle Book, Leave No Trace, Lost Creek Park, Pack 1991, Pinewood Derby, Pledge of Allegiance, Progress Toward Ranks beads, Robert Baden-Powell, Sam Houston Area Council, The Buddy System, The Law of the Pack, Thunderwolf district, Tiger, Webelos, Wolf, YPT, arrow points, belt loops, camping, craftsman projects, cubmaster, den, flag ceremony, fleur-de-lis, handbook, honesty, knots, marbles, neckerchief, orange, pack meetings, patches, popcorn, positive attitude, safety, service projects, slide, uniform, whittling.